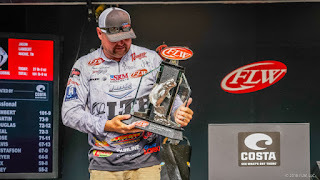 IBASSIN: Jason Lambert Wins 2018 FLW Tour Kentucky Lake with 101-09lbs! Jason Lambert Wins 2018 FLW Tour Kentucky Lake with 101-09lbs! Jason sets record with 28 pound winning margin. No questions. No doubts. No surprises. No one even came close to catching Jason Lambert on the final day of the FLW Tour event presented by Costa Sunglasses on Kentucky Lake. The Michie, Tenn., pro added another 27 pounds, 3 ounces to his total weight to finish with an astounding four-day total of 101 pounds, 9 ounces. Lambert began the day with a lead of more than 19 pounds over Scott Martin, and finished with a winning margin of 28 pounds, which is a new FLW Tour record. The previous record was 23-9 by Randall Tharp at Lake Okeechobee in 2012. 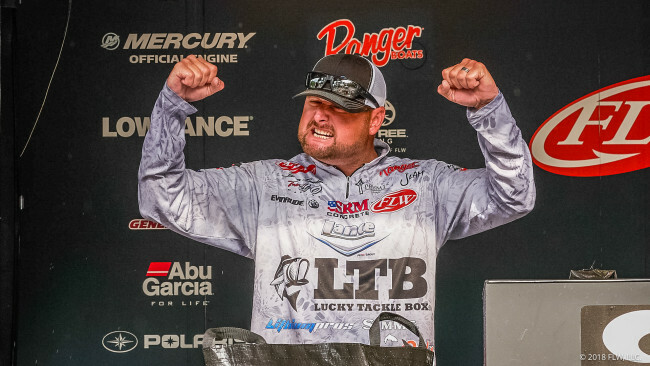 Lambert’s overall weight is the most ever at Kentucky Lake (besting his record of 97-2 from 2016), and ranks 10th all-time among FLW Tour events. Since 2016, Lambert has won three multi-day FLW tournaments on Kentucky Lake, all during the months of May and June, which comprise the heart of the ledge-fishing season, and he’ll be back in a few weeks to compete in the Costa FLW Series tournament out of neighboring Lake Barkley, where he’ll be the odds-on favorite once again. Yesterday, Lambert basically put it out of reach by catching 30 pounds, 8 ounces. He started on a community hole at the northern end of the lake and had 20 pounds in the box quickly. That was a main-lake spot where a school of hawgs was hanging out on a current-facing point on a narrow ridge. He then added a pair of 5-pounders and a 9-pound, 2-ounce kicker from another main-lake school that basically showed up that morning on an old waypoint. Today, he blew everyone away in the first hour. “I started this morning where I caught that 9-pounder and them two 5s yesterday,” Lambert says. “I had, like, two 3s and a 5. That was the very first three casts of the day. The next stop was his starting area from day three. That’s where it got ugly. Before the flurry was done, Lambert had culled a 5-pounder. He had his final weight by 10:30 and was back at Kentucky Dam State Park by noon, where Lambert spent the afternoon chatting with fans and media and eating pizza. Kentucky Lake’s bass really aren’t out in full force on the ledges quite yet, but the last two days have certainly been the best of the postspawn season – for Lambert, and for some of his competitors who sacked up 20-pound bags as well. “It’s getting better,” he says. 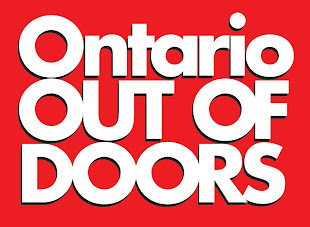 “There are more coming out. That place I started on this morning, when I saw it Friday, there were five or six down there, and I couldn’t get them to bite. When it went over it yesterday morning there were a dozen or more, and there were more than that on it when I went over it this morning. His primary lure was a Castaic Baits Jerky J (5 and 7 inch) fished on a 1-ounce Scrounger-style jighead. He says the bill on the original Scrounger was made with a very specific type of plastic, and it’s difficult to find because it’s no longer being used to make commercially available heads. He’s having his custom-made just the way he likes them. Lambert fished the bait on 18-pound-test Sunline Super FC Sniper Fluorocarbon with a Duckett 360RW 7.1:1 reel and a 7-foot, 11-inch Duckett White Ice II swimbait rod. The presentation is simple. Lambert casts it out, lets it hit bottom and slow-rolls it back on a straight retrieve. The Scrounger/Jerky J combo wobbles subtly on the retrieve, with just a little hunting action. Lambert admits that it doesn’t look like much in the water, but the fish obviously can’t help but to eat it. The most important part of the presentation is making a precise cast to the spot where the fish are positioned. Lambert was able to identify bass from carp on his electronics by their positioning. When they were lined up in neat little rows along bottom, they were bass, and it was on. The only time he strayed from the pattern was on day two, when he couldn’t get on his starting spot in the morning and had to run farther south to a secondary area that was too shallow to graph. He fished an 8-inch Gene Larew TattleTail Worm on a jighead using the same Duckett reel and a 7-foot, 6-inch Duckett Micro Magic Pro rod. Fishing today, Lambert had little worry about finishing the win. Today, it was about putting an exclamation point on another impressive victory. He got it, and a slew of FLW records to go with it, and another trophy to take home to Tennessee.